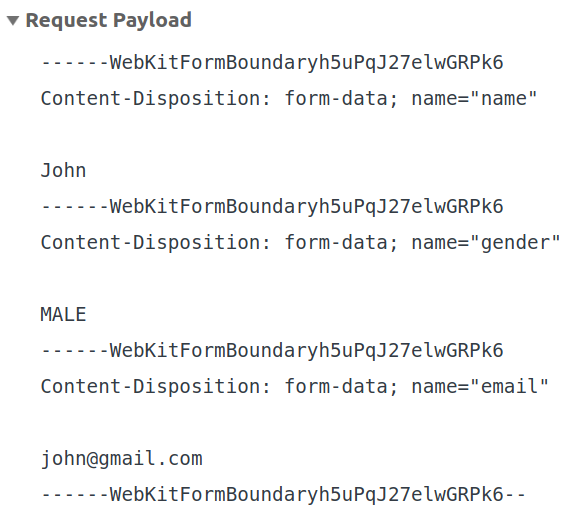 Serialization of form data means to create a string of URL encoded name-value pairs of the form data parameters. Each pair is separated by a & character. You can form a query string of encoded key/value pairs by appending parameters to a string, but somehow doing that seems like a waste of time. There are external libraries that do this — but using libraries for such small purposes is not very right. The good news is that modern browsers have methods that can serialize form data natively. This happens with the URLSearchParams and FormData objects. For a GET request, you can get a url encoded query string by using the URLSearchParams object. Multiple values for a single parameter can also be handled. When no files are being uploaded, the Content-Type header of the POST request is usually application/x-www-form-urlencoded. The query string in this case is just like the query string of a GET request — each name-value pair separated by a & character. So you can use the URLSearchParams object in this case also (described above). When files are being uploaded, the Content-Type header of the POST request is multipart/form-data. In this case form data is separated by a specific boundary. The URLSearchParams object won't work in this case. You will need the FormData object here.